Crosman AirSource 1077 adapter upgrade kit. .
400 SHOTS PER CYLINDER! This kit allows you to use the Airsource 4 oz. bottles for your 1077. Fits right in where your CO2 cartridge goes. Includes adapter, black cylinder cover and one 4oz. cylinder. Up to ten times the number of shots compared to standard 12g Powerlet. Things I liked: Once in place you can shoot the gun to your heart's content, it lasts long. Things I would have changed: Make it a little less bulky if they could. What others should know: I had no trouble with the item. You can shoot for ever and not run out of CO2. I liked the valve to remove the system when you want and you can still shoot for a bit before removing the adapter. Why waste the gas as I can tell when the pellets start dropping and quite then. The only down side is the gun seemed to have less over all power than with the 12gr. Powerlet. Why? I don't know. It just seemed to but that power remained consistant throught the use of the cylinder. Great item if you want to shoot all day and it worked great in my indoor range as high power didn't matter. Things I liked: great idea, love the valve so you can turn the tank off and remove when done shooting without having to empty tank. Things I liked: Built very well, works as claimed. Things I would have changed: Replace the cover with a molded rubber grip that would take up the space between the bottle and the installed grip. This would spport the bottle if the gun is dropped. Cheaper bottles. What others should know: There is quite a bit of CO2 that remains in the tube after the valve on the adaptor is closed. The bottles are costly. I searched on Google and found a few stores selling it. 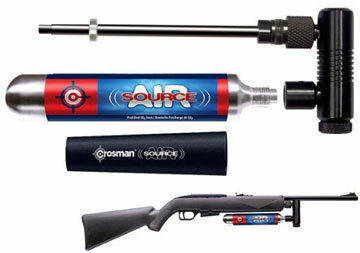 Just type "Crosman AirSource 1077 adapter upgrade kit" into Google and you will see other stores advertising that they have it.